Team Second Wind did it! They conquered the bridge and have raised over $15,000 for research! 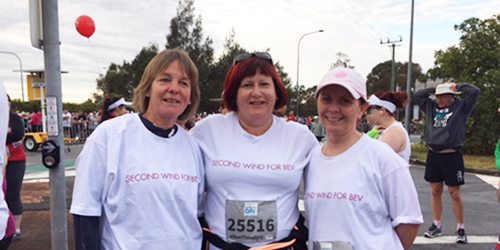 On Sunday 30 August this inspiring team from the QLD Lung Transplant Service ran and walked the 5km and 10km in the Bridge to Brisbane to support research at The Prince Charles Hospital. The team did a fantastic job, especially transplant recipient Heather who finished the 10km leg just 12 months on from her transplant at The Prince Charles Hospital. It really was a team effort that brought together transplant patients, families and friends as well as staff and scientists from The Queensland Lung Transplant Team at The Prince Charles Hospital. Thanks to this fantastic fundraising result their support will fund more than 340 hours of world-leading lung transplant research happening right here at the Charlie’s campus. Their fundraising page is still active and you can support their team by making an online donation here.